Dubai, UAE, 12th February 2019: The GUESS Jeans Spring/Summer 2019 collection is a celebration of contaminations between urban styles with exotic influences, and between ‘80s and ‘90s vibes with a contemporary flair. A blend of pop colours, vintage graphics and floral prints adds character to a collection designed for fashion explorers on trendy summer adventures. The first line is pervaded by a chic Parisian allure, played out in seemingly simple garments infused with a deep sense of style. A burst of vibrant reds, oranges, greens and blues underscores the personality of statement outfits. Clearly urban in attitude, floral prints add a bohemian touch to feminine blouses and exquisite dresses with a genuine French appeal. Exotic scenes act as a backdrop to jungle and animal prints evoking distant lands. 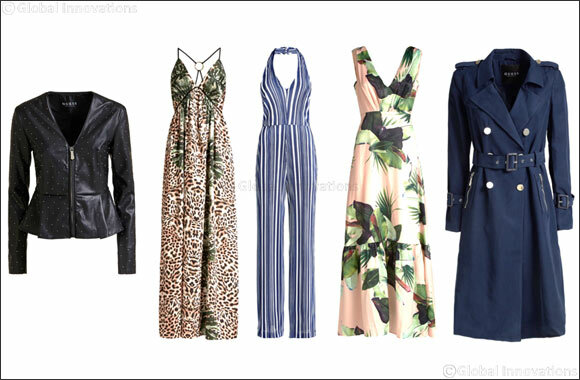 Leaves and ferns contrast with animal prints, for GUESS girls eager to take a walk on the wild side. Evocative African inspired shades make for a colour palette in natural, earthy tones, picked up by dashes of vibrant red and yellow. Crisp primary hues put a colourful spin on sensual leopard prints, while select pieces flaunt military-inspired designs revealing a strong and self-confident personality. In the height of summer, gossamer-light fabrics release a joyful, unrestrained femininity. Once again, flowers bloom, this time with a fresh and romantic magnetism, highlighted by a delicately glamorous colour palette in tones of powder pink and light blue - the perfect match for denim. Striped patterns inject a touch of zesty style, while broderie anglaise steals the scene on sensual dresses and tops. Ever at the heart of the GUESS DNA, Denim continues to steal the show with extra lightweight fabrics that keep you cool even in the hottest temperatures. A special “feather weight” denim features a Tencel blend – with fibres originating from raw wood – to ensure high breathability, a soft hand and utmost recovery. For him, the collection features light and fluid denim pieces echoing the iconic 1990s fashion, occasionally matched with rigid fabrics with a definite vintage appeal.